The presidential candidate's plan would hit companies like Amazon that rake in big profits but enjoy low tax bills. An analysis by the Institute on Taxation and Economic Policy, a left-leaning think tank, that was released on Thursday found that the number of publicly held corporations that pay no federal taxes more than doubled last year to 60, thanks in part to the $1.9 trillion tax cut President Donald Trump signed into law. 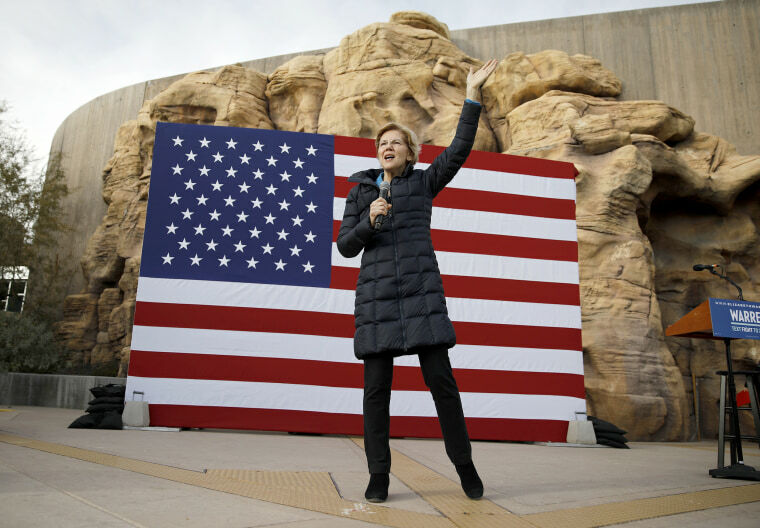 "Everybody profits from being part of this country and everybody ought to make a contribution," Warren said Thursday in an MSNBC interview. "Little sized businesses do it, medium sized businesses do it, families do it, we want the big corporations to do it, too." The senator pointed to Amazon as an example. The company paid no federal taxes on $11.2 billion in income last year, according to ITEP. The company defended its tax practices on Thursday in response. “Amazon pays all the taxes we are required to pay in the U.S. and every country where we operate, including paying $2.6 billion in corporate tax and reporting $3.4 billion in tax expense over the last three years," a spokesperson said in a statement. "Corporate tax is based on profits, not revenues, and our profits remain modest given retail is a highly competitive, low-margin business and our continued heavy investment." Warren responded on Twitter that she did not dispute Amazon met its obligations under existing law. "That's the problem," she said. "It's a small new tax — but because our richest, biggest corporations are so skilled at minimizing their taxes under our current system, that small new tax will generate big new revenue," she wrote in a Medium post.